In BMO Online Inventory Malaysia you can set a maximum credit limit for your customers. When your customer’s debt hits the maximum debt limit, BMO’s inventory system will not allow your company to make additional sales with the contact. This is a crucial function to avoid company loss and allows your employees to be aware of customer’s debts. 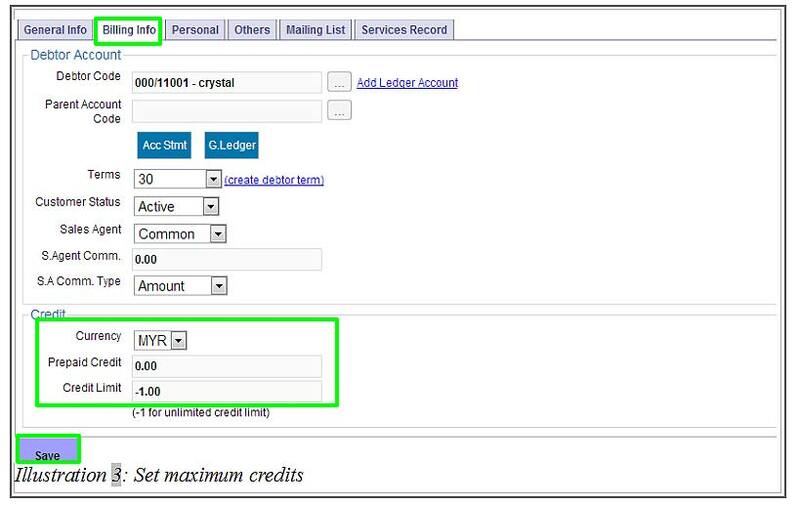 In this tutorial, we will guide you on how to set the credit limit for your customers. 1. Go to Contact > Contact List . 2. Find the contact that you want to set credit limit in Contact list, and then click Edit at the right column of that contact. 3. After clicking Edit the contact, click on Billing Info tab and scroll down to Credit section. Select the Currency your company is using, insert the Prepaid Credit that the current contact and the Credit Limit you would like to impose for this customer. After you have complete filling the details, click Save. 4. You will be asked to confirm about updating the contact. Click OK to apply the changes.